The SK1 Wilderness Survival Kit is the premium Survival Kit. 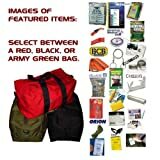 What is in the Survival Kit SK1? Many included survival kit items carry NATO, MoD or US Government Approval!